Behind the scenes at the Missouri Botanical Garden, Horticulture Division staff and volunteers propagate plants and care for collections at the Greenhouse Complex. The one-acre complex includes 18 heated greenhouses, one unheated greenhouse and a small outdoor nursery area for trees, all connected to a large central hallway called the Head House. The overwhelming majority of the Garden’s rotating display plants begin as seeds, seedlings or cuttings, which are propagated on site. Close to 200,000 plants are produced each year in the Greenhouse Complex, including some 39,000 spring, 78,500 summer and 49,000 fall bedding plants (many of which can be seen well into the spring in outdoor displays). About 200 aquatic plants, 575 pot crops, 700 tropical foliage plants for the annual Orchid Show, and 800 potted poinsettias and 2,600 assorted plants for the annual Gardenland Express holiday flower and train show are also produced in the greenhouses. One-hundred 18-inch, hand-mossed hanging baskets are grown and assembled every year. Each year, over 1,100 eight-inch mums are ordered and maintained prior to planting in the Garden. Routine maintenance in the Greenhouse Complex includes watering, fertilizing, growth regulator application, pest control, repotting, pruning and even weeding some greenhouse gravel floors. 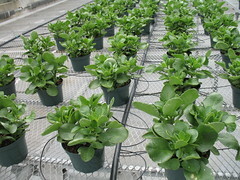 In the Head House workstations are used for propagation and transplanting. Plants in each greenhouse have different environmental needs; so temperature, humidity levels, light levels, soil and fertilizer require adjustments and variations from greenhouse to greenhouse. Four main production greenhouses are dedicated to spring and summer bedding plants. Two are glass structures, housing a combined 7,688 square feet; the other two are polycarbonate structures, housing a combined 3,456 square feet of greenhouse space. The two poly houses also have heated floors, which during winter encourage root growth in pansies and other early spring plants while their foliage gets acclimated to a greenhouse temperature as low as 45 degrees. This is done so the plants become acclimated to survive a light frost when placed outside in the Garden’s displays. During the summer, temperatures in these two houses are adjusted so horticulturists may grow other plants for rotating displays throughout the year. 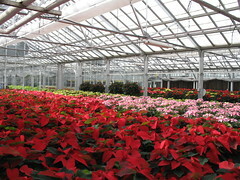 Approximately 800 poinsettias are also housed in the main production greenhouses from their arrival as cuttings in May through their display in the annual holiday show of November and December. Three greenhouses accommodate the overflow of plants that are used for production, including bedding, tropical and some foliage plants. These greenhouses can accommodate any size of plants, from knee-high to tree-sized. One greenhouse is known as the stock house, where cuttings are taken for spring and summer bedding plants. Each year the stock plants are re-started and new additions made to accommodate the ever-changing outdoor plant designs. One greenhouse is divided into two sections: one side for the aquatic nursery, and the other for propagated plants. The aquatic nursery includes the Garden’s tropical water lilies and other aquatic plants, which start either from seed or tubers each year and are eventually transplanted into various pools for public display once the outdoor temperature is consistently warm enough for the plants to thrive. The newly-propagated plants on the greenhouse’s other side include anything grown from seed or cuttings specially-requested by a Garden horticulturist to complete their design for an outdoor display garden. One smaller greenhouse is used as a shade house in the summer for Cymbidium orchids and assorted shade perennials. It is also used as a cool house in winter to protect young perennial plants. It is the only unheated greenhouse in the complex. The Greenhouse Complex is also home to several permanent plant collections, including roughly 7,500 orchids, 700 cacti and succulents, and 8,000 aroids and other plants collected in the field by the Garden’s scientists. Three greenhouses are devoted to the Garden’s historic orchid collection, one of the largest and finest in the United States. The three are distinguished by the varying environments they offer: there is a cool, an intermediate and a warm temperature house. The orchid collection represents approximately 280 genera, including Cattleya, Laelia, Encyclia, Oncidium and Paphiopedilum, which offer a diversity of color and form. The Garden has over 2,500 unique orchid taxa represented in its roughly 7,500 plants. The public can view the collection during the annual Orchid Show, held from February through mid-March. About 700 to 800 plants are on display at any one time, with spent blooms rotated out for new ones each week. One greenhouse contains the former Desert House collection of rare and unusual varieties of cacti and succulents from all over the world. The Desert House was home to these specimens from 1913 through 1994, when the public display conservatory was torn down due to deterioration. Since then, the Garden’s collection of about 700 plants has been housed in the Greenhouse Complex and are not available for public viewing. As the plants grow too large for their greenhouse, cuttings are taken from the original and propagated to maintain the collection. Of special interest in the desert greenhouse is the Welwitschia mirabilis. It is the only plant comprising the entire genus of Welwitschia, native to Africa’s Namib desert and considered to be a living fossil. Three greenhouses are utilized by the Garden’s Research Division staff and contain approximately 8,000 plants. Approximately 98 percent of the collection is composed of many species of Aroids devoted to one collector, Dr. Tom Croat. The remaining two percent belongs to various research staff and students interested in maintaining live plants for research purposes. A staff of eight horticulturists and 30 volunteers ensure smooth operations in the Greenhouse Complex throughout the year. While maintaining and ordering the Garden’s plants for public displays can prove challenging, the tasks stay fresh thanks to the diversity of plants selected. Horticulture staff stay tuned in to current trends and new items available on the market each year, often incorporating these plants into their garden bed designs. While the Greenhouse Complex is closed to the public throughout the year, visitors can get a behind-the-scenes glimpse at operations through tours which are given periodically through the Garden's education department. Visit the website www.mobot.org and check the public events calendar for dates each year.